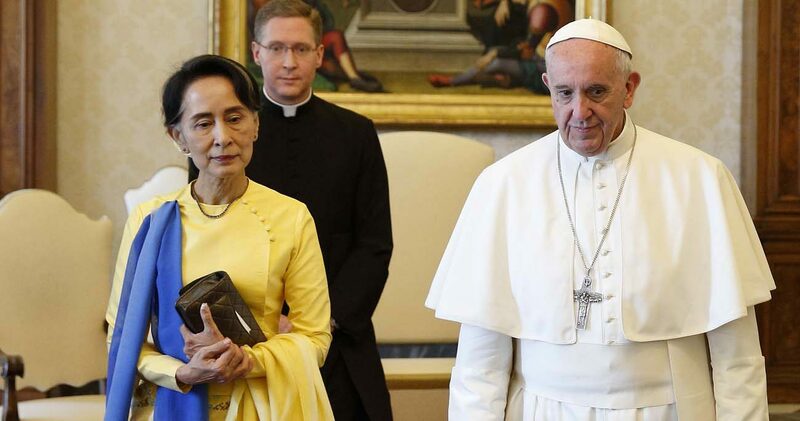 VATICAN CITY (CNS) — Shortly after Pope Francis met privately with Myanmar’s de facto leader, Aung San Suu Kyi, the Holy See and Myanmar announced they were establishing full diplomatic relations. The Vatican announced May 4 that the pope would appoint a nuncio to the southeast Asian nation and that Myanmar would name an ambassador to the Vatican. The agreement brings to 183 the number of countries with which the Holy See has full diplomatic relations. Suu Kyi, who was awarded the Nobel Peace Prize in 1991, had spent almost 15 years of the period between 1989 and 2010 under house arrest. Her party, the National League for Democracy, won the general election in 2015 and she was named the de facto head of government in April 2016. Welcomed to the Vatican by Pope Francis, Suu Kyi took his hand and bowed her head. She and the pope met privately for more than 20 minutes before her entourage entered the papal library. “The dry thorny branch that blossoms and bears fruit symbolizes the passage from selfishness to sharing, from war to peace,” said a Vatican description of the medallion. Suu Kyi has won international support for her efforts to shore up Myanmar’s fledgling democracy after decades of military rule, but serious questions have been raised about her government’s treatment of the Rohingya people, who are Muslim. The 2017 annual report of the U.S. Commission on International Religious Freedom labeled Myanmar one of 16 “Tier 1” countries of particular concern based on their level of religious repression. According to the Vatican’s latest statistics, Myanmar has about 659,000 Catholics out of a population of about 51 million.